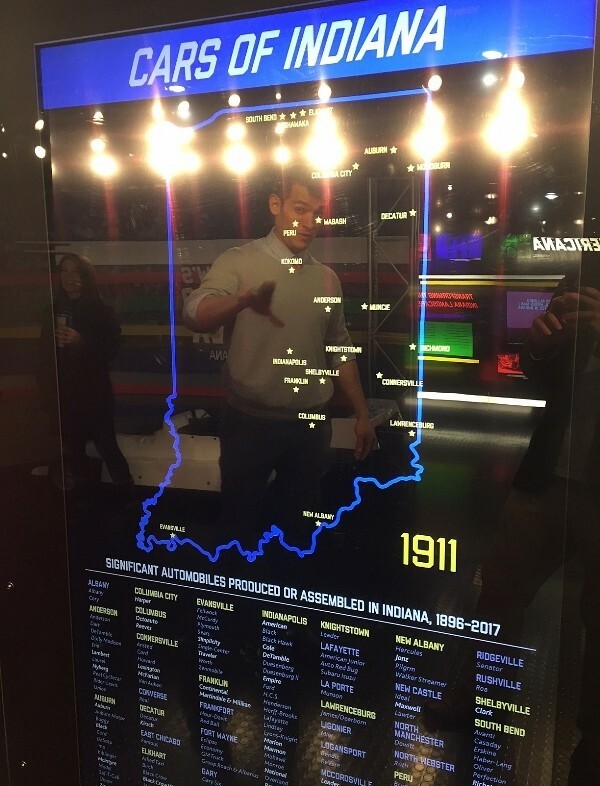 I was granted a sneak peek Thursday of the Indiana Historical Society’s new traveling exhibit, History on Wheels. 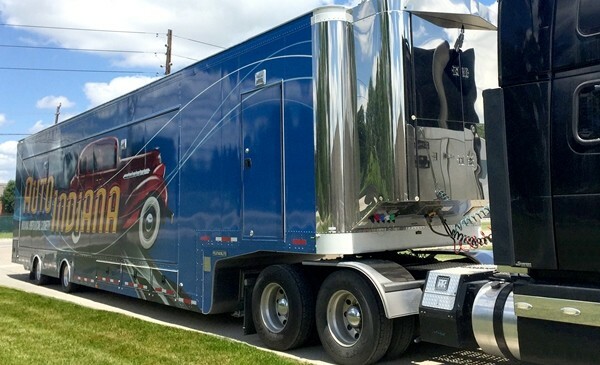 Housed inside a 53-foot double expandable semi-trailer, the one-of-a-kind exhibit celebrates Indiana’s incredible contributions to the automobile industry within 1,000 square feet of indoor museum space. 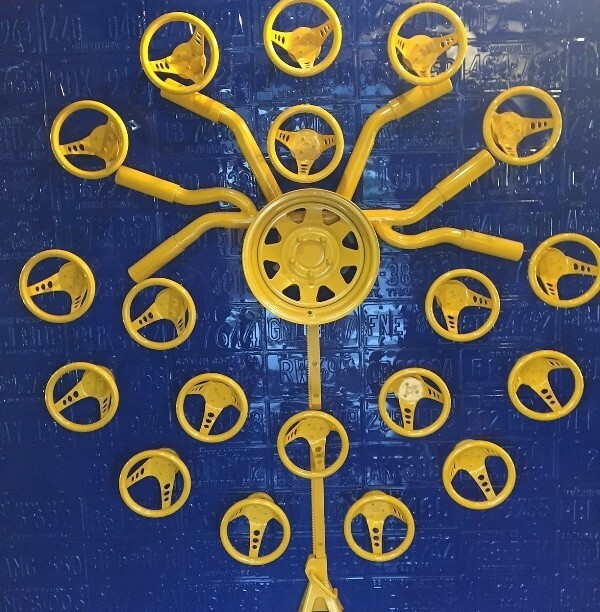 Ever since Elwood Haynes famously took his first “horseless carriage” out for a stroll on Pumpkinvine Pike in Kokomo in 1894, Indiana has been putting its stamp on automotive lore, climbing back to No. 2 in the nation (behind only Michigan) in automotive production. 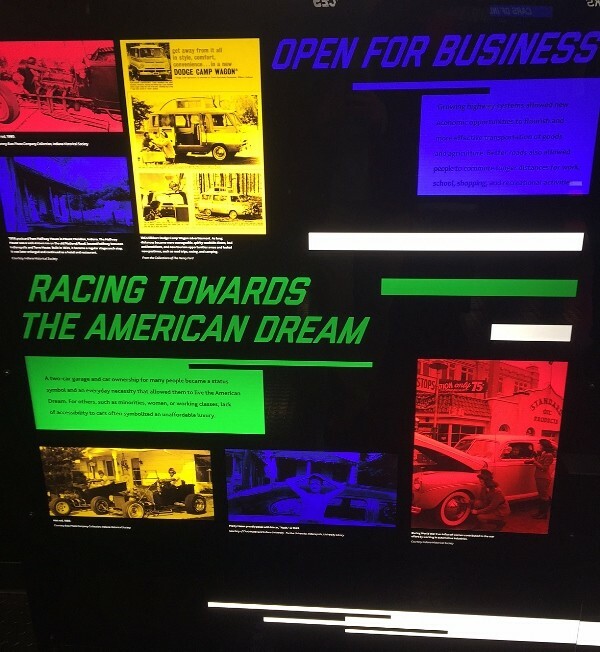 The exhibit touches on the history of more than 100 Indiana automakers and manufacturers, such as Duesenberg, Gibson and Studebaker. It also delves into the lives of Hoosier innovators and inventors, such as Carl Fisher, Haynes and Ralph Teetor. IHS History on Wheels program manager Curt Barsic guided me around the colorful display. He relays that IHS hopes the exhibit will draw at least 100,000 annual visitors as it makes its way across the state and strives to be featured in 20 festivals per year. (The exhibit will be on the road for at least five years). He points out one display that contrasts scenes from the 1934 Indianapolis 500 with its 100th running in 2016. 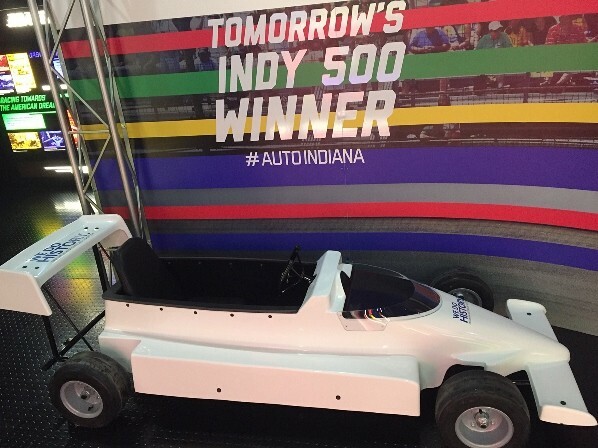 The public will get its first chance to see History on Wheels Saturday, May 6, when IHS launches the traveling exhibit with free admission and extended hours in honor of the OneAmerica 500 Festival Mini-Marathon. 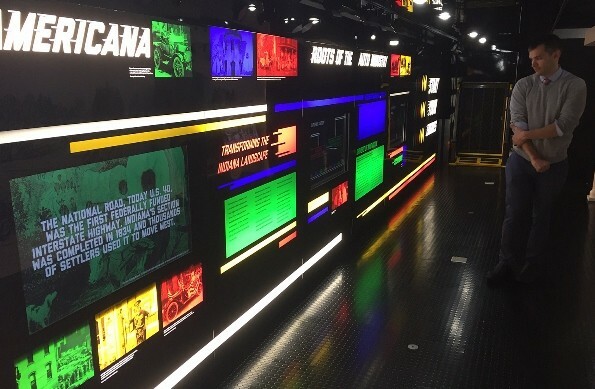 History on Wheels will be open 8 a.m. to 5 p.m. at the Eugene and Marilyn Glick Indiana History Center, located in downtown Indianapolis, across the street from the Mini post-race party. The exhibit will remain at the History Center and be included with admission to the Indiana Experience May 7-13. 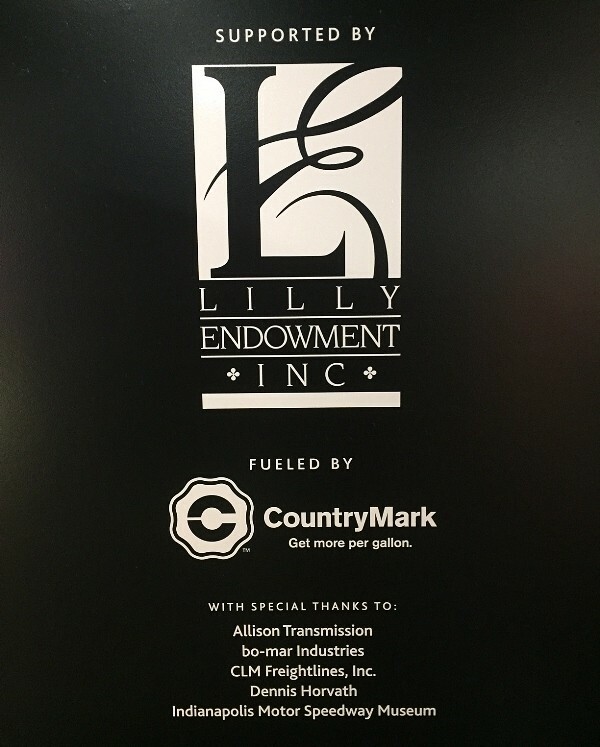 History on Wheels is supported by Lilly Endowment Inc. and fueled by CountryMark. For reservation fees and booking information, contact Mark McNees, IHS History on Wheels coordinator, at (317) 234-2029 or mmcnees@indianahistory.org. More event locations and details are available on IHS’s website at www.indianahistory.org/HistoryonWheels. At Allied Tube and Conduit, safety must come first. Randy Pratt, a member of security and traffic control staff, checks drivers in and out, makes employees aware of safety rules and keeps an eye on operations such as tubing fabrication and laser machine usage. In a manufacturing environment, Pratt understands the importance of keeping his team safe. Pratt is pursuing a bachelor’s degree in business. Attending the Chamber’s 2015 Safety and Health Conference & Expo provided further training while exposing him to the opportunity to learn more about business. Pratt has been a part of his company for seven and a half years, with two years in his current position. Since attending the conference with the Chamber, Pratt has tried to implement a “safety culture” in his workplace where employees will be held accountable for being safe. One tool he has used from the conference is “gamifying” safety, which makes the concept more inviting by presenting safety rules like a game. Pratt also enjoyed the legal briefings he received. 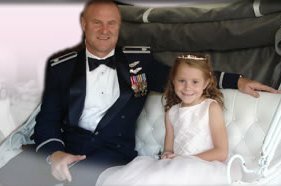 The Cinderella Ball is a fun-filled program designed to foster positive relationships between fathers and their young daughters. At the Royal Palace, our goal is to empower fathers to build foundations of self-confidence and self worth in our daughters that will help them grow into strong, independent young women. Additionally, the Princess Power component of the program encourages our daughters to develop a compassionate nature and learn to share their blessings with the less fortunate in our communities. We’ll help you create memories that will last a lifetime. All you have to do is join us! The next ball will be held Friday, Sept. 20 at 6 p.m. in the Palomino Ballroom in Zionsville. For more information or to sign up, visit www.thecinderellaball.com. I love fall. It is my favorite season of the year, by far. The air is cool and crisp and everything smells like straw and cinnamon. Brilliant hues of orange, red and yellow are everywhere – in the trees and bushes and in piles of fallen leaves. There are hayrides and bonfires to attend; apple cider and pumpkin pie to consume. It’s not too cold to play outside yet and just around the corner are Thanksgiving and Christmas. Honestly, fall is one of the top reasons I know I don’t ever want to live anywhere else. Nothing, to me, beats fall in the Hoosier state. To celebrate and honor our most favorite season, my husband and I took our nine-month-old daughter to her very first apple orchard and pumpkin patch (via hayride) in Hendricks County. We took part in an apple festival, visited vendors and sampled sweet and tart apple treats and cider. It was oh-so-quaint (until she tried to stuff a handful of hay into her mouth, that is). Even with the severe drought we encountered this summer, the pumpkin patch was bursting with bright orange surprises. My husband made a muddy forage for our prized pumpkin and we created a fun memory. All-in-all, we spent less than $25 for an afternoon of family enjoyment and appreciation of the bountiful nature we have around us. But maybe a pumpkin patch isn’t your thing. There are a TON of other things to do in Indiana during the fall. If you want something the whole family can enjoy, try a trip to the numerous festivals around the state. More of a sophisticated palate might like to sample from Indiana’s wineries and breweries. Or, did you know that Kokomo is home to the oldest manufacturer of opalescent and cathedral stained glass in the world? You’d learn more about that on the Glass Trail. Maybe you’re more into exploration and adventure – the Indiana Cave Trail might suit your liking in southern Indiana. Even though I’ve lived here the majority of my life, I had no idea where to start looking – and even less of an idea as to what Indiana has available – until I stumbled across the Visit Indiana (Indiana Office of Tourism Development) web site dedicated to Hoosier fall offerings. Check it out for yourself and take in some of the wonderful treats Indiana has to offer: www.in.gov/visitindiana/fall/. Since the mid-1990s, the Indiana Chamber has helped lead efforts to secure a more accurate reporting of our state and local graduation rates. Without question, we have made significant progress from the days when school districts like Indianapolis Public Schools (IPS) would claim a 90% graduation rate, despite graduating less than a quarter of the ninth graders that had been enrolled four years previously. But even as the data have improved, so have the "tricks" being utilized. This time, the primary culprit of the manipulation is an excessive use of waivers from the state’s high school graduation exam. As reported July 1 by the Indianapolis Star, 27% of IPS graduates in 2011 received a waiver from the state’s graduation requirements. Now let’s not lose sight of what this means. The current state requirement is for students to pass tests covering 10th grade English and Algebra I, a course that most students take in either the eighth or ninth grade. So the expectations are not very high. Nonetheless, a school can waive students from these low level requirements if there is evidence – through coursework or other exams – that the student has genuinely mastered the material. In other words, the waivers are intended for those extremely rare instances when, due to test anxiety or some other extreme circumstance, the repeated failure of these tests really does not reflect the student’s abilities. Instead, some districts like IPS are using the waivers to pass through students whom they have deemed as having "tried hard enough." Let us not worry how those young adults will be received in the real world, where "trying" – and failing repeatedly – will not be sufficient. 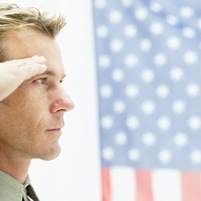 There are no "waivers" in the real world – especially for such low expectations. But alas, IPS is certainly not the only culprit in this mess. Statewide, over 5,000 students (about 8% of all graduates) received waivers from these minimal diploma requirements in 2011. That’s up dramatically from 2004, when the statewide number was just a few hundred – and even those numbers were likely higher than they should have been. Additionally, we keep hearing about high schools that are counseling families to withdraw from school with the stated intention of being home schooled – thereby removing those students from the high schools’ student count, regardless of any evidence that any home schooling actually occurred. In 2009, for example, 97 students left Kokomo High School supposedly to be homeschooled – nearly 5% of the entire school. At Michigan City, the number was 87 (4.5% of total enrollment); at Muncie South, it was 83 (over 8%); at Warren Central, it was 94 (2.5%); and so on. So while the new "official" graduation rate has inched up to 85%, these and other concerns suggest, once again, that we are dealing with false numbers. Indeed, our own estimates, using several national calculation methods, suggest that the real graduation rate (without waivers) remains at a dismal 70%. That actually is an improvement over the last several years and appears to be a reversal of a steady decline that had occurred since the early 1990s. But it is a far cry from the 85% that is reported officially by the state. Representative Bob Behning (R-Indianapolis), chair of the House Education Committee, has already announced that he will have legislation in 2013 to address these issues. Having worked with Rep. Behning 10 years ago to address the previous problems with our state data, we are pleased to see his leadership again. Meanwhile, be leery of the claims that you may be hearing. We sure wish that those gains were real. Indeed, we need them to be real, but the true data strongly suggest otherwise. We like to say here at the Indiana Chamber that we have the biggest and best annual business celebration. Sure I’m a little biased, but I think that was proven to be the case again Thursday night. Don’t take our word for it. The 1,400-plus attendees certainly seemed to enjoy themselves. Governor Mitch Daniels helped get the ball rolling and the night closed with keynote speaker Terry Bradshaw putting on an excellent show. There were the three major awards, of course. Congratulations to Business Leader of the Year Jean Wojtowicz, Government Leaders Brian Bosma and David Long, and Community of the Year Kokomo. Check out their video profiles and stay tuned for photos, a video recap of the event and more in the coming days and weeks. It’s about much more than just the awards. It’s business, community and political leaders coming together and celebrating what makes Indiana great. It’s only 11 months and 12 days until the 23rd Annual Awards Dinner, which will feature Washington Post reporters Bob Woodward and Carl Bernstein on the 40th anniversary of Watergate and the lessons learned that apply to today’s political world. Join us November 1, 2012 and see for yourself what a great event this is. The proverbial "15 minutes in the sun" can last a lot longer — particuarly if one takes proper advantage. Case in point: Kokomo and its 2011 Indiana Chamber Community of the Year award. It was announced on October 3 and will be officially presented at the 22nd Annual Awards Dinner on November 17. The good people in Kokomo are doing things right, showing in part why they earned the award in the first place. The downtown announcement a few weeks ago attracted a good crowd and featured the unveiling of a large banner on the side of City Hall. Community members were genuinely emotional about receiving the honor. They plan to be out in full force on November 17, celebrating along the way at the city’s own annual Alliance event on November 3. Throw in a new logo commemorating the award and other steps to leverage the recognition and "15 minutes" has already been blown out of the water. The multi-year effort by so many to earn the title is rightfully being matched by strategic follow-up and execution. Congrats again, Kokomo, and we look forward to hosting you next month. The Chamber’s press release calls Kokomo — being recognized as the 2011 Community of the Year at the upcoming 22nd Annual Awards Dinner — a "comeback kid." Maybe it should have termed the city the longest of longshots since Rocky Balboa entered the boxing ring against Apollo Creed for the first time in 1976. While Rocky didn’t win that battle in the ring (off subject: too bad they didn’t stop that Rocky series after the first two entries), Kokomo emerged from its four leading businesses being in bankruptcy at the same time and unemployment that soared above 19%. During several recent visits to Kokomo to document its story for our BizVoice magazine and the video at the November 17 awards event (no Rocky, but Terry Bradshaw will be the featured speaker), it’s clear that sheer determination of community leaders was one of the primary reasons for the turnaround. People like their hometown, and they didn’t want it to become a victim of an economic downfall that was largely out of their control. Congratulations, Kokomo. We look forward to sharing the story of how it all happened in the weeks ahead. Indiana cities are often in competition to attract new businesses to their communities. The City of Kokomo, Indiana has developed an incentive program it hopes will attract residents of nearby communities to purchase a house in Kokomo. The city has enlisted the help of its major employers to draw employees who work in Kokomo, yet live elsewhere, to consider purchasing a home there. The Kokomo Homeownership Investment Program provides homebuyers with incentives. Among those is a $5,000 reimbursement for exterior improvements on a newly purchased home. In addition a local moving company is offering a ten percent discount when moving a new resident or family to Kokomo. Kokomo’s largest employers support the program and are promoting it to their workforce. Companies such as Chrysler, Delphi Electronics and Safety, and Haynes International were helped in recent years with municipal loans or abatements, and now these companies are returning the favor by touting Kokomo’s relocation incentives and benefits of living in the community in which they work. More Kokomo Homeownership Investment Program details can be found at www.trykokomo.org.